"Are Neutrons Simply Electrically-Compressed Hydrogen Atoms?" Temperature of the halo-like corona is 300 times than that of the surface. Rotates faster at equator, faster on surface. Solar wind accelerates upon leaving the Sun. Sunspots travel faster than surrounding surface. Sunspot penumbra (interior walls) reveal structured filaments. "Is the Sun part of a binary star system?" Solar maximum: "is the period of greatest solar activity in the solar cycle of the sun. During solar maximum, sunspots appear. Solar maximum is contrasted with solar minimum. Solar maximum is the period when the sun's magnetic field lines are the most distorted due to the magnetic field on the solar equator rotating at a slightly faster pace than at the solar poles. The sun takes about 11 years to go from one solar maximum to another and 22 years to complete a full cycle (where the magnetic charge on the poles is the same)." Solar minimum: "is the period of least solar activity in the solar cycle of the sun. During this time, sunspot and solar flare activity diminishes, and often does not occur for days at a time. The date of the minimum is described by a smoothed average over 12 months of sunspot activity, so identifying the date of the solar minimum usually can only happen 6 months after the minimum takes place. Solar minimum is contrasted with the solar maximum, where there may be hundreds of sunspots." "Where have all the sunspots gone?" "Solar Cycle 24 has officially started"
"Is a New Solar Cycle Beginning?" "Mystery of the Missing Sunspots, Solved?" Maunder Minimum is the name given to the period roughly spanning 1645 to 1715 (graph time-span: 1645-2000). During one 30-year period within the Maunder Minimum, astronomers observed only about 50 sunspots, as opposed to a more typical 40,000–50,000 spots in modern times. Average Solar Magnetic Index from 1991 to 2008-10-6 . See also: "Solar Cycle 24 Begins". The diagram is showing the rising temperature from the photosphere (varying from 4.000 to 6.400 Kelvin, with a current average of about 5.800K), to the chromosphere (4.500 to as high as 20.000 Kelvin) to the corona (temperature from 1.000.000 up to 10.000.000 Kelvin). Heliospheric current sheet - The solar electro-magnetic vortex, which is also named the Parker spiral. If a solar flare is exceptionally powerful, it can cause coronal mass ejections (CME). 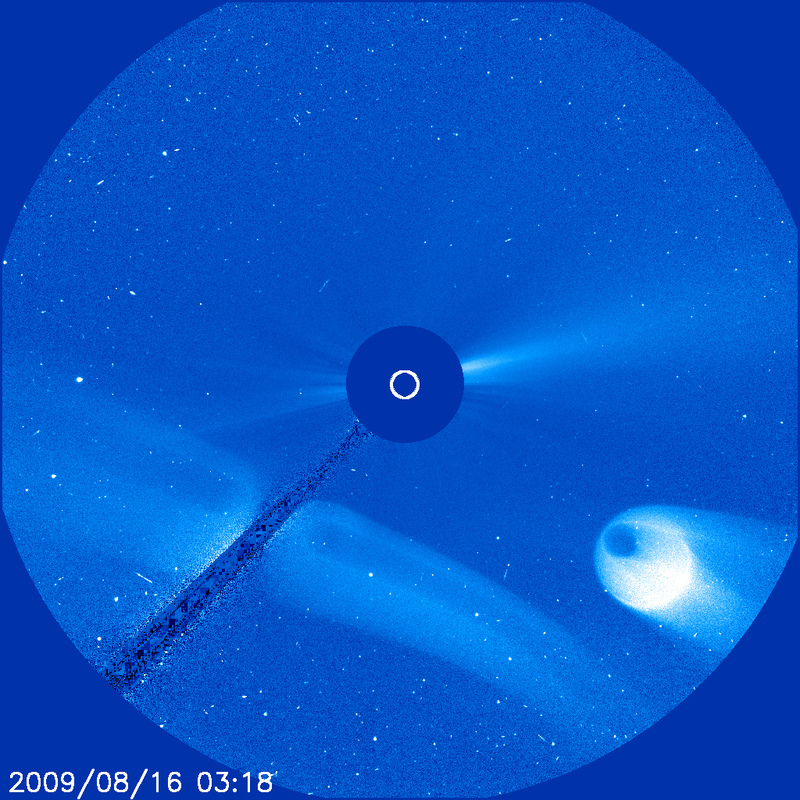 A coronal mass ejection is an ejection of material from the solar corona, usually observed with a white-light coronagraph. 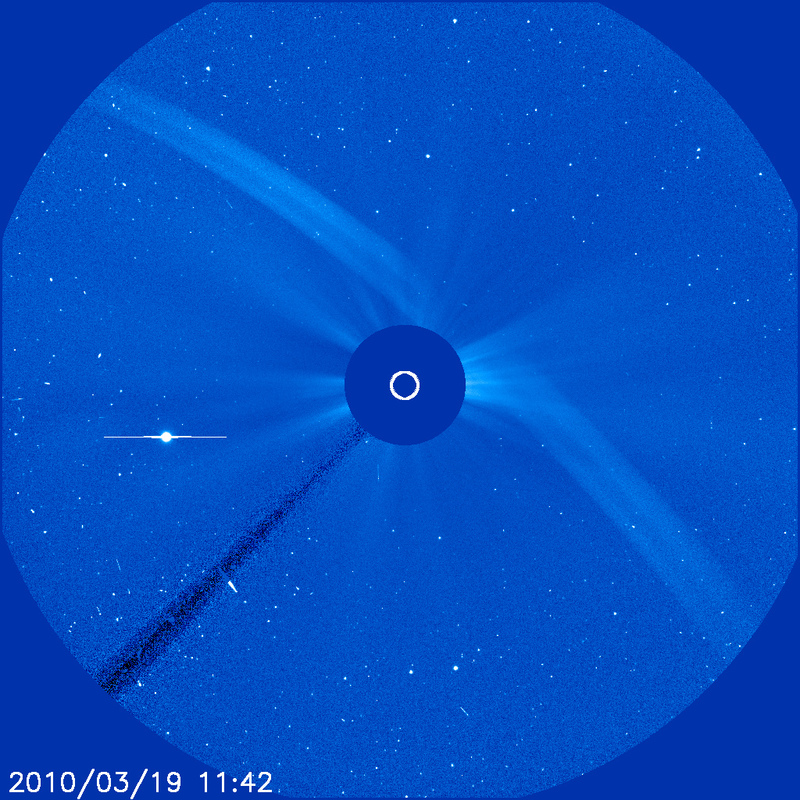 The ejected material is a plasma (containing small quantities of heavier elements such as helium, oxygen, and iron), plus the entraining coronal magnetic field. The central umbra, which is the darkest part, where the magnetic field is approximately vertical. The surrounding penumbra, which is lighter, where the magnetic field lines are more inclined. The region of solar microflares has a strong association with the sunspot regions. "The heliographic locations of about 25,000 microflares observed by the RHESSI (see also: ) satellite [over a 5 year period]. Note: the similarity with the mid-latitude region of Earth being the most active in lightning strikes (among other weather phenomena). 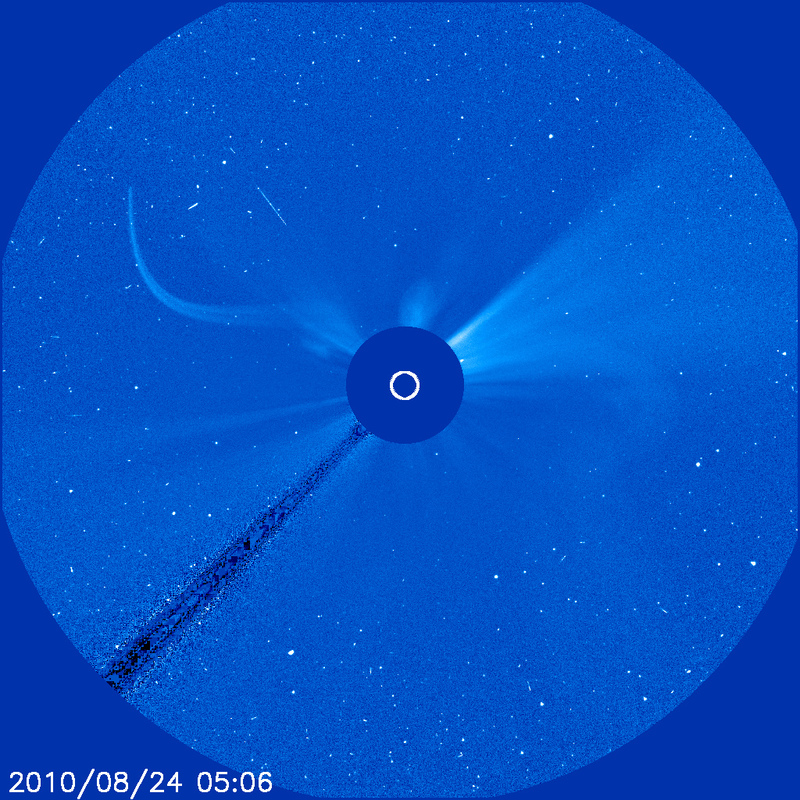 Comet collision with solar wind. See the animated version here. To research: Are some of the images below a carefully crafted New Age agenda hoax, or visual traces of real cosmic events? The huge spherical/disc shaped object around which is some form of bright energy field which is also shaped as a sphere/disc. The (controlled?) flexibility and speed. The (purposeful?) close encounter with the Sun, but never any impact signs. Compare the tracings with a cometary impact trace. This page was last modified on 24 March 2011, at 01:32.